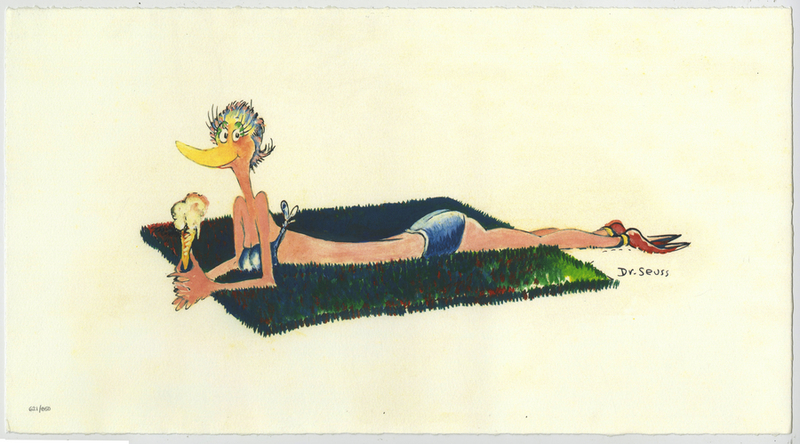 This is a limited edition print entitled "Sunbathing Bird" that was created by the Dr. Seuss art program. The print is created to top archival standards and with the highest quality reproduction with an attention to the detail of recreated the original artwork. This print is accomplished with pigment inks on archival Somerset paper. The The overall paper measures 11" x 20" with a hand-deckled edge, and the image itself measures about 6.5" x 14". The print is hand-numbered and is accompanied by the original COA from the publisher. This is an authorized edition from his estate and was adapted posthumously from an original watercolor painting created by Dr. Seuss. This print is part of the regular edition which is limited to 850 prints and the print is in excellent condition.